Kobelco Construction Machinery Europe B.V. (KCME) is pleased to announce the arrival of the all-new SK45SRX-6, and the latest version of its class-leading SK55SRX-6 to the growing European Kobelco dealer network. Th e SK45SRX-6 is new to the European market and is the direct result of 80 years Japanese excavator manufacture allied to modern technology and customer feedback. This latest arrival to the time-proven range of Kobelco Short Radius (SR) Mini excavators perfectly fulfils the role required of a 4.5-ton mini-excavator and neatly slots in between the popular SK30SR-6/SK35SR-6 of the 3-3.5-ton class and the updated SK55SRX-6 (5.5-ton). We save you money by exceptional fuel efficiency courtesy of the latest generation Yanmar engine (Type 4TNV88-B). Providing exacting power and performance for the SK45SRX-6 and SK55SRX-6, while meeting the latest stringent emissions regulations, this clean engine nets a 23% reduction in fuel consumption when used in S-mode (normal work) operation over the already efficient H-mode. Further fuel saving comes with integrated hydraulic circuitry from the three on-board hydraulic pumps to reduce the overall engine/hydraulic workload while maintaining class-leading work performance. A one-touch decelerator button can now be found on the operation lever as well as the dashboard. Kobelco’s Integrated Noise and Dust Reduction Cooling System (iNDr) fe atures on the new SK45SRX-6 and SK55SRX-6 and is recognised for greatly enhancing serviceability by allowing easy access to the air filter now mounted in front of the radiator system, which reduces day-to-day servicing downtime and use of additional tools to clean the filter. Together with the front-facing air inlet and under-slung exhaust system, iNDr actively reduces on-site noise output – a necessary requirement when working in populated suburban areas, or in the close proximity of attending workforce. Day-to-day working life is an all-important consideration in machine operation and purchase; and Kobelco is an authority on ope rator care and safety. The SK45SRX-6 has a host of operator enhancements that come as standard equipment. An example would be the operator’s chair, which now reclines and features mechanical suspension. The climate control system is fully integrated into the dash and to the right of the operator on the SK45SRX-6 and SK55SRX-6; this provides increased operator visibility to the rear and right of the new machines. An opening rear window can assist with air flow. The radio entertainment systems now support Bluetooth along with ports for USB drive and auxiliary input. Standard safety equipment for the two machines includes under-boom working light, rear view mirrors and an emergency glass-hammer. 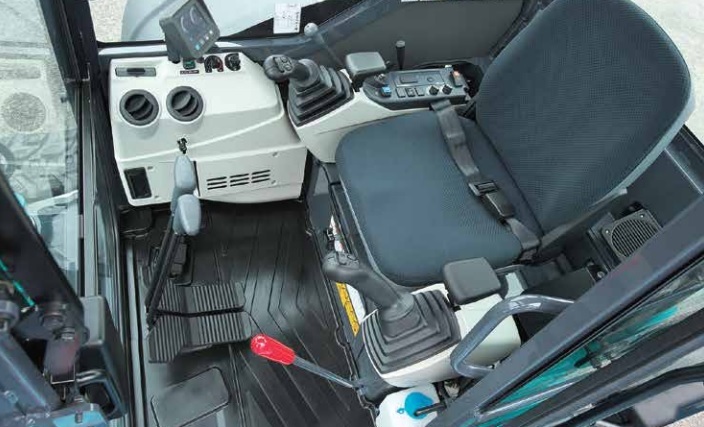 Both cabs meet ROPS and Top Guard Level 1 standards but do not detract from what is an obvious spacious working environment. Rubber cabin floor mats now have raised edges to retain dirt until they are easily removed for cleaning. 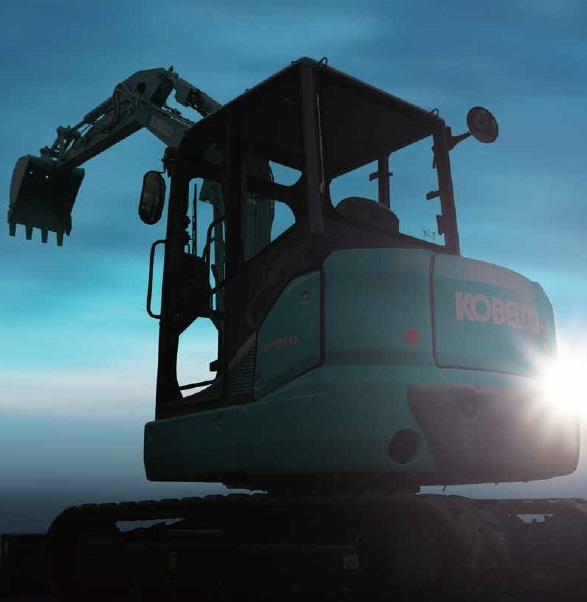 Kobelco design and support has enabled both excavators to be easily kitted out with optional components. This includes as standard quick Coupler piping (aka Quick Hitch), bracket for rotating warning light, and the ability to connect the Colour Multi-Functional Display for at-a-glance machine status update.